Westerns are by nature stories of simpler times. 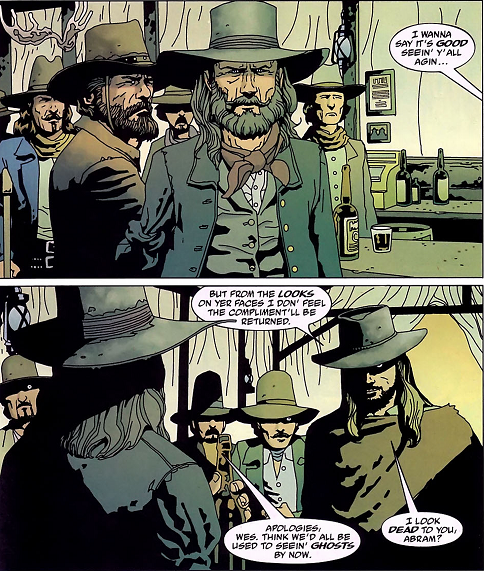 Even the with the simplified character sets of the terrific Jonah Hex books, it is a formula which has withstood the test of time and continues to work to this day in the hand of a skilled writer. Azzarello isn’t a man who settles for simplicity and this is evident in his Loveless series. But does he manage to pull it off? The long and short of it is yes, for a time. After all, he is one of the industry’s elite writers and he knows how to write complex characters better than anyone else in the business. It is 1867, two years after the end of the American Civil War, and things are anything but simple down in Blackwater, Southern Virginia when Wes Cutter appears back on the scene. Cutter, an ex-confederate soldier, has just been released from a prison camp and is finally heading home, much to the annoyance of the locals. His good-for-nothing brother had spread the word that he died in the camp, which predicated certain changes in the town. Specifically, his land was seized by the now Union controlled local government and his wife forcibly evicted from it. Cutter isn’t the kind of guy who lets things like that go and he has a plan of bloody redemption figured out for all of those who wronged him and his wife. As a side-story we have the tale of a young Black soldier in the Union army who shoots a white crippled boy dead– not a smart thing for a Black man to do in a Southern state during this period of time. His story deals with the still present tension between the North and the South, with an eye on the darker side of American history. Those of you who are familiar with Azzarello’s other works wont be surprised to hear that the plot twists and turns through the dark under-bellies of life without ever revealing the full extent of what is going on to the reader. It is a tried and tested formula he uses and it works once again here, but at times it can be quite hard to follow what is going on; it is one of those books that you appreciate more on the second reading. In a direct comparison of Azzarello’s 100 Bullets to Loveless: Bullets is a better series on the whole, but this series starts off much stronger. The art is handled by Marcelo Frusin (Hellblazer) similar in style to Eduardo Risso, (100 Bullets). Given images from each artist, it would be difficult to tell them apart. The artwork is characterized by simple colours and shapes, and the real story is told through the use of the shadows. This allows characters not in play to remain as eerie, lurking shadows in the background until they are ready for their dramatic reveal. My only issue with the art is that it makes people hard to tell apart sometimes if the faces are drawn with too much shadow over them, such as when they are wearing hats– which, as a Western, is a common problem. On the whole this a is very good book of the standard we have come to expect from Azzarello, if not necessarily Earth-moving. Worth a read, but only if it’s not at too dear a price. A strong 4 out of 5. We wouldn’t expect any less from our friend Brian. 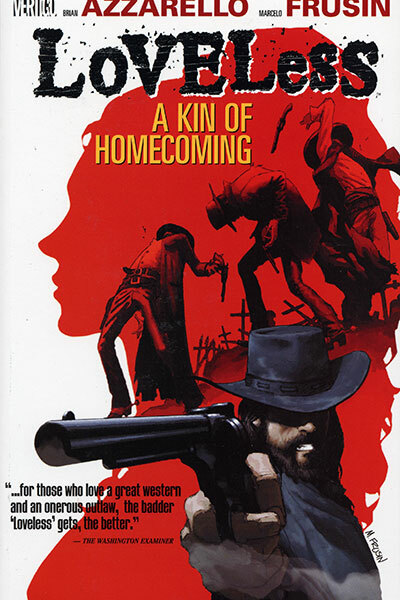 Not essential for DC, or even DC Westerns but essential for Loveless. Azzarello was quoted saying that El Diablo planted the seeds for this series; while not essential for the series, it might be a nice read to get yourself in the mood for this volume. You can pick up the other two trades in the series, Thicker Than Blackwater and Blackwater Falls; the first of which is as strong as this one, although the later sadly is not. If you liked the pacing, you could pick up the first volume of 100 Bullets. Or if you just want more western fun you could give Jonah Hex a go but don’t expect as complex tale from him.